SAN FRANCISCO (KRON) - Today officials will break ground on the 101 Express Lane projects, which will add 32 miles of express lanes in both directions to ease travel through San Mateo and Santa Clara counties. 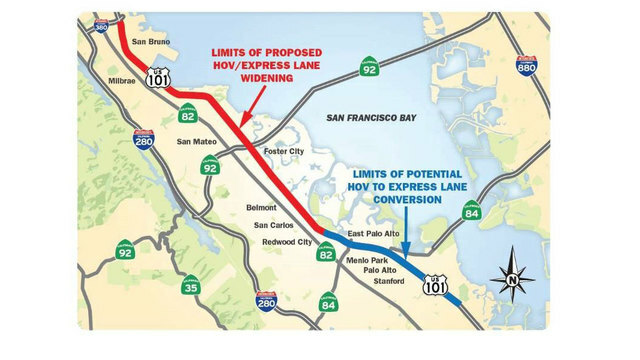 The express lanes will be in both directions on U.S. 101 between I-380 in San Bruno and State Route 237 in Sunnyvale. The $514 million project is funded from a variety of sources, according to Cal Trans, including SB-1 funds. Officials say the express lanes will reduce congestion in the corridor, improve travel times and reliability, and encourage carpooling and transit use. Right now there are no carpool lanes on Highway 101 in San Mateo County north of Whipple Avenue. Caltrans will convert the existing northbound and southbound auxiliary lanes into through-lanes, and change the far left lanes into express lanes. At Whipple Avenue, the new express lanes will connect with existing carpool lanes. Caltrans will convert these carpool lane into express lanes. The joining of express lanes will create two 22-mile long express lanes. At this time the estimated completion date is mid-2022. >> Click here to learn more about the project.